That's how long I have to find a new job and a company willing to sponsor me to stay in Canada. My employer decided to end my contract, right before the sponsorship deal was complete. Obviously I'm not going to explain the whole story on my web log, but suffice it so say, I was pretty upset. I do however have an interview next week, so stay tuned! Things could be back on track if all goes well. 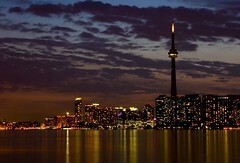 In the meantime, here is a photo taken from the Toronto Island of the skyline at night. Enjoy! The Gits! That was just not on - good luck with the job search, if I can be of any help do let me know. I know I'm here in the UK but you never know. You got railroaded man. Damn the man for not helping you out and leaving things to the last possible minute. I'll bet that they told you that 'everything in the power was done' to help out in whatever way they could. Good luck with job search. I'm coming to this picture rather after the fact, but I just wanted to say I think it's charming. Do you publish your exposure settings and camera/lens details somewhere on your site? Was this a long exposure?